(P1) Thirty years ago, as the nation MOURNED the loss of seven astronauts on the SPACE SHUTTLE Challenger, Bob Ebeling was ENVELOPED in his own deep GRIEF. (P2) The night before the launch, Ebeling and four other engineers at NASA contractor Morton Thiokol had tried to stop the launch. Their managers and NASA OVERRULED them. (P4) When Challenger exploded 73 seconds after LIFT-OFF, Ebeling and his colleagues sat STUNNED in a conference room at Thiokol’s headquarters outside Brigham City, Utah. (P5) They watched the spacecraft explode on a giant television screen and they knew exactly what had happened. (P6) Three weeks later, Ebeling and another engineer separately and ANONYMOUSLY described that CONTENTIOUS pre-launch meeting to National Public Radio (NPR) journalists. Both were DESPONDENT and in tears as they described hours of arguments. The data showed that the rubber seals on the shuttle’s booster rockets wouldn’t seal properly in cold temperatures, and it was known that this would be the coldest launch ever. (P7) Ebeling, now 89, is speaking to NPR again on the 30th anniversary of the Challenger explosion, and allowing us to IDENTIFY him. (P10) A presidential commission found FLAWS in the space agency’s decision-making process. But it’s still not clear why NASA was so ANXIOUS to launch without delay. (P11) The space shuttle program had an ambitious launch schedule that year and NASA wanted to show it could launch regularly and RELIABLY. President Ronald Reagan was also set to deliver the STATE OF THE UNION ADDRESS that evening and planned to discuss the Challenger launch. (P12) Whatever the reason, Ebeling says it didn’t JUSTIFY the risk. (P15) He says the same thing today, his eyes watery and his face GRAVE. The data he and his fellow engineers presented, and their persistent and sometimes angry arguments, weren’t enough to SWAY Thiokol managers and NASA officials. Ebeling concludes he was INADEQUATE. He feels that he didn’t make the case against launching well enough. (P16) As a religious man, this is something he has prayed about for the past 30 years. (P18) I reminded him of something his late colleague and friend Roger Boisjoly once told me. Boisjoly was the other Thiokol engineer who spoke anonymously with NPR 30 years ago. He came to believe that he and Ebeling and their colleagues did all they could. Do you think that Mr. Ebeling should feel guilty about what happened, or was it beyond his control? 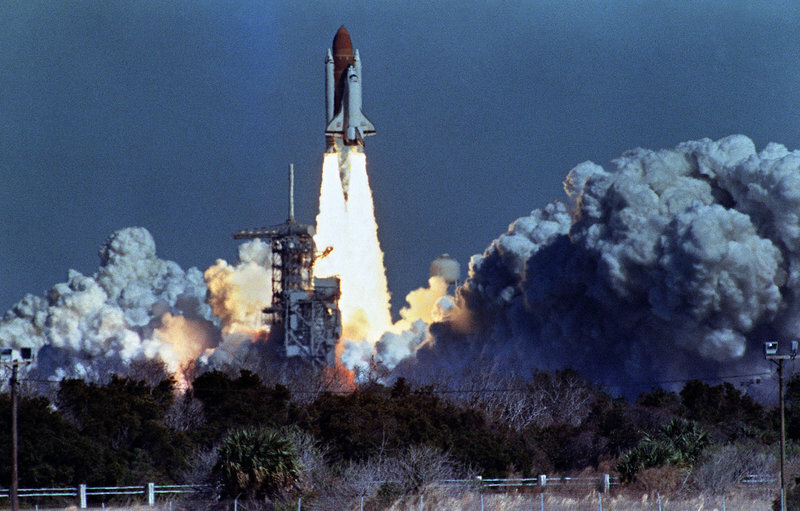 Why was NASA so anxious for the launch to happen on schedule? The live television coverage of this disaster is among the most memorable broadcasts in history. What news events have you seen on television that you can’t forget? There hasn’t been a moon landing in more than 40 years, and in general we go into space far less than we used to. Why do you think this is true?